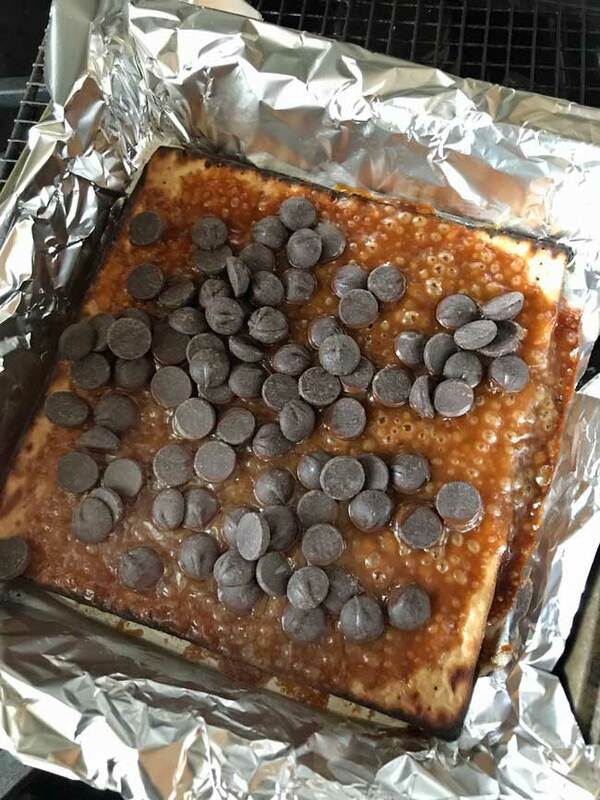 A couple of weeks ago I tried a Girl Scout cookie creation called Trefoils Toffee, a recipe where you lay Girl Scout shortbread cookies on a tray, pour a 2 minute microwave caramel sauce over them, then top with chocolate and nuts. It’s a variation on the old time classics Saltine Cracker Candy and Matzo Crunch, but a little richer with the shortbread crust. Ever since we finished the Trefoils Toffee, I’ve had my mind on variations. And since we’ve had matzo around this week, I couldn’t resist creating a new version of Matzo Crunch. Or maybe not so new. 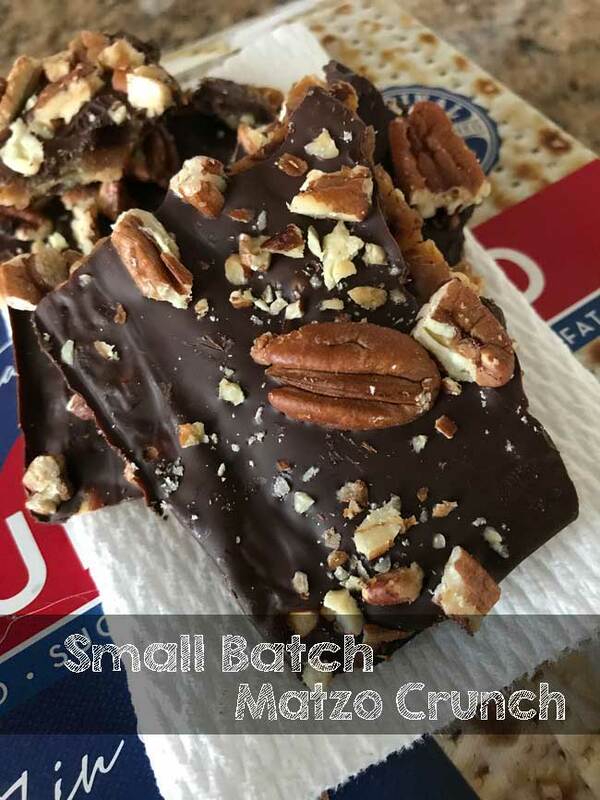 This is really just a quick, streamlined and small batch Matzo Crunch. You can most definitely use Saltine instead of matzo, but one 7 inch sheet of matzo fits perfectly in an 8 inch square pan. Matzo is the perfect base. The caramel topping is the same as usual, but calls for only 1/4 cup salted butter and 1/4 cup of brown sugar and is prepared in the microwave. Personally, I never have much luck making caramel type things in the microwave, but this one didn’t let me down. Nothing burned or boiled over and the topping hardened up nicely. Here’s what it looked like when I pulled it from the oven. For this batch I used Ghirardelli Bittersweet Chips. 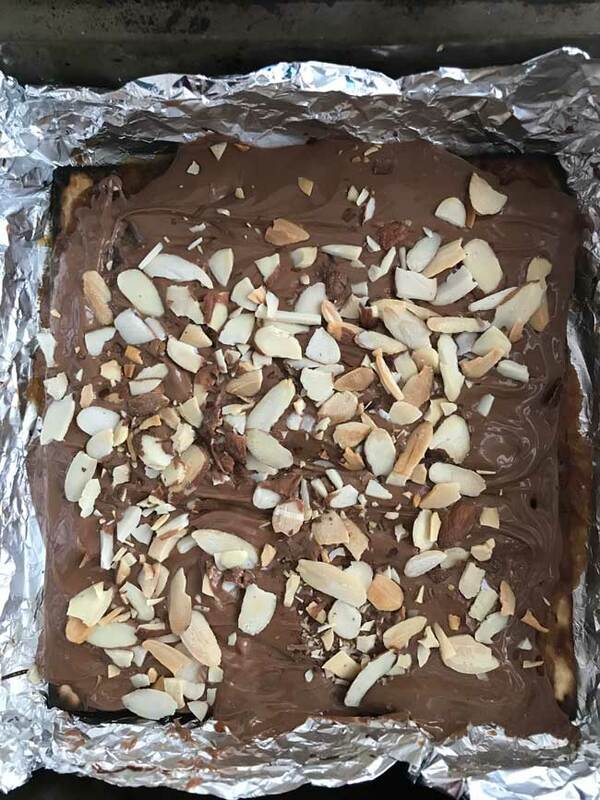 After making this batch I wanted to try a variation, so I made another one using Cadbury milk chocolate and almonds and liked the milk chocolate version even better. Going forward I’ll make multiple small batches so that I can change the flavor rather than just making Matzo Crunch in one big batch. Plus the 8 inch square pans are easier to fit in the refrigerator than large trays. Quick Small Batch Matzo Crunch is made in an 8 inch square pan. Preheat oven to 350°. Line an 8-inch square metal pan with nonstick foil or line with regular foil and grease foil with some extra butter (or cooking spray). 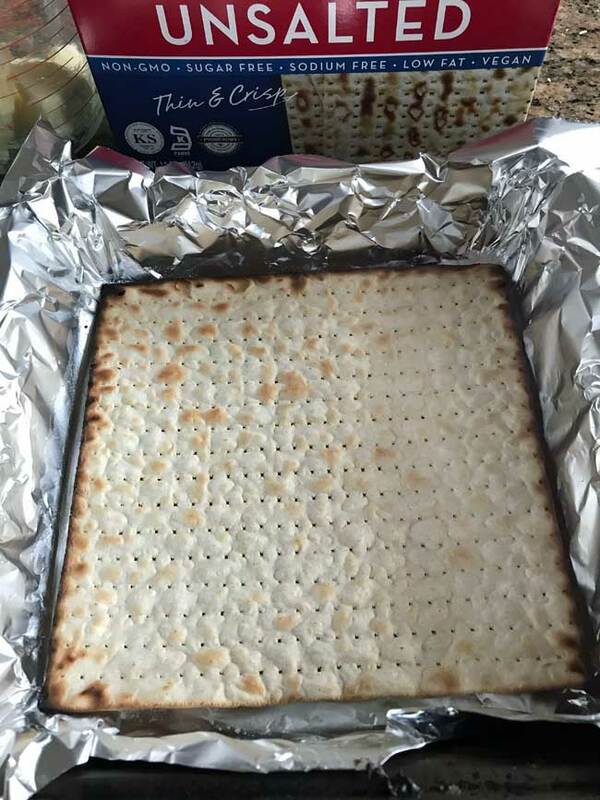 Set the sheet of matzo in the pan. Put the butter in a microwave-safe 2 cup measure (I use a Pyrex liquid measuring cup) and heat the butter for 30 seconds or until it is partially melted. Add the brown sugar and stir until smooth. Put mixture in microwave and microwave for 2 minutes, stirring every 30 seconds. Pour over the matzo. Bake at 350 for 10 minutes or until caramel is very hot and bubbly. Remove from oven and let cool on a wire rack very briefly -- just about 3 minutes or until caramel settles down. Sprinkle chocolate chips evenly over hot caramel. Set a flat pan on top of the square pan to help hold in the heat. Let stand 5 minutes to soften chips, then spread softened chocolate chips over caramel. Sprinkle nuts over the top. Refrigerate until chocolate and caramel have hardened, about 1 hour. Break or cut bark. I’m definitely going to try it with Ritz! I haven’t tested in a glass pan, but I suppose the same directions would work. You may want to take it out after 8 minutes rather than 10. Next time I make this I’ll use a glass pan and update the results. Thanks for the “quick” version of this recipe. I make a huge batch of this every Passover on a large cookie sheet. EVERYONE loves it!!! I have made it during the year with Saltines and Ritz Crackers and it is really good! The buttery Ritz cracker base is my family’s favorite! No one can believe that this was made with crackers! Looks good! Our grocery storeis already giving away boxes of matzo, so I’m currently looking for ways to use up some of the boxes I recieved. If I use a glass baking pan, would the time and temp be the same?